As Rhosydd was remote from any major settlements it was normal practice for the quarrymen to barrack or lodge at the quarry. They would arrive early on the Monday morning carrying enough food to last through the week. Unlike some of the other Ffestiniog quarries there was no such luxury as a quarrymen's train. To get to work entailed a hard walk, in all weathers, over rough mountain tracks. The working week lasted until Saturday lunchtime. The main barracks at Rhosydd on level 9 - the main working area. Between the two buildings ran a tramway to the waste tips. The earliest barracks were on level 4 and were probably occupied from 1859 to 1899. The later and well preserved barracks on either side of the "street" on level 9 came later. The southern row being built in the 1860's and the northern side added after 1890. Although it gives the appearance of a street the space between the two accomodation blocks only carried a tramway for tipping rubbish. Over the years the number of men barracking declined. Some men, notably those who lived in Blaenau Ffestiniog, preferring to walk to work each day rather than put up with the appalling conditions. 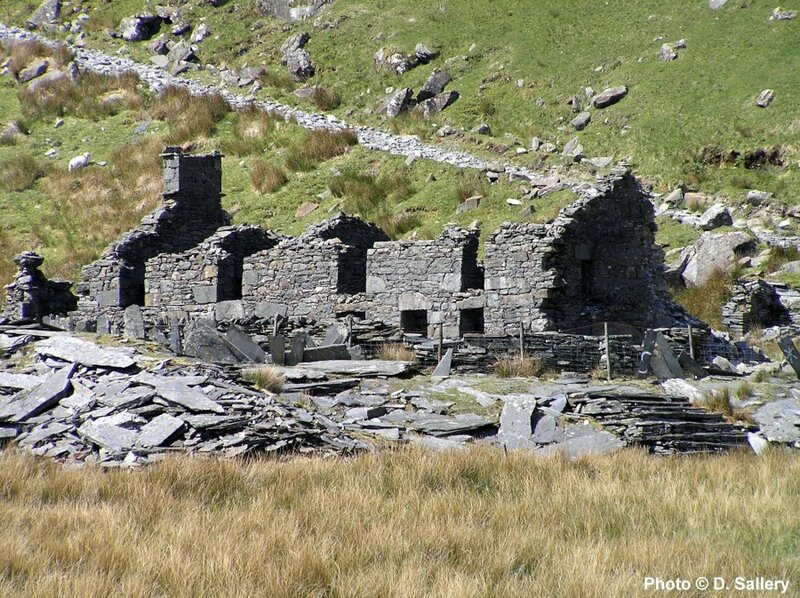 Living conditions for the men with families were somewhat better as the quarry had built terraced accomodation in Cwmorthin. Conditions underground were both primitive and basic, particularly when compared to Rhosydd's near neighbour - Croesor quarry - which led the industry in innovation. Electric lighting was a luxury found only in the main tunnels underground and all the actual mining took place using candle light only. Whereas other quarries had special tunnels for the men to reach the workings, in Rhosydd they had to share the tunnels and inclines with the tramways. Despite all this the quarry had a very good safety record, immeasurably better than Cwmorthin quarry - known colloquially as "The Slaughterhouse". However one sobering statistic puts this in context. From 1876 - 1885 the average lifespan of a Ffestiniog quarryman was only 44 years. Not all the employees at the quarry were single men and for those with families the quarry had built a terrace of six cottages in Cwmorthin. The ruins of "Rhosydd Terrace" are seen here. As these cottages were several hundred feet lower than the quarry and sheltered from the wind, conditions here were slightly better. The steep path up to the quarry is in the background. 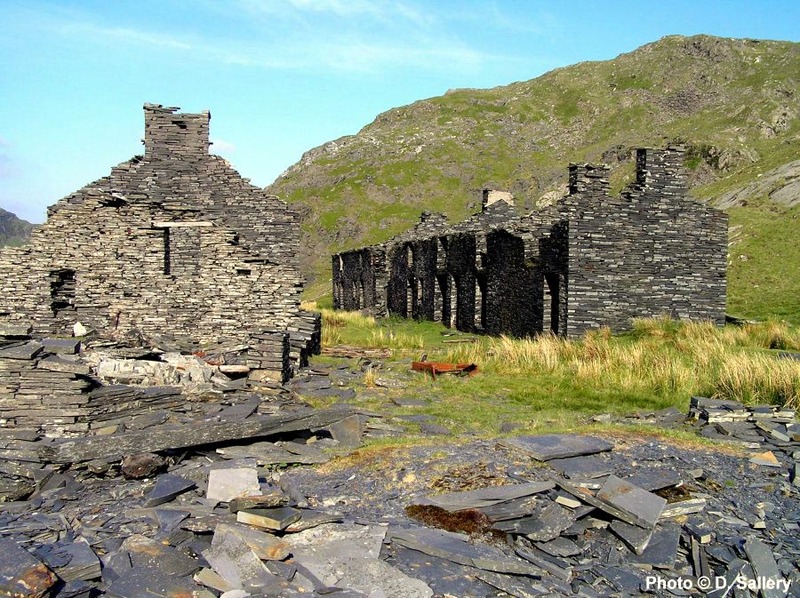 Now derelict, Rhosydd chapel was built in 1867 to serve the spiritual and community needs of the quarrymen. 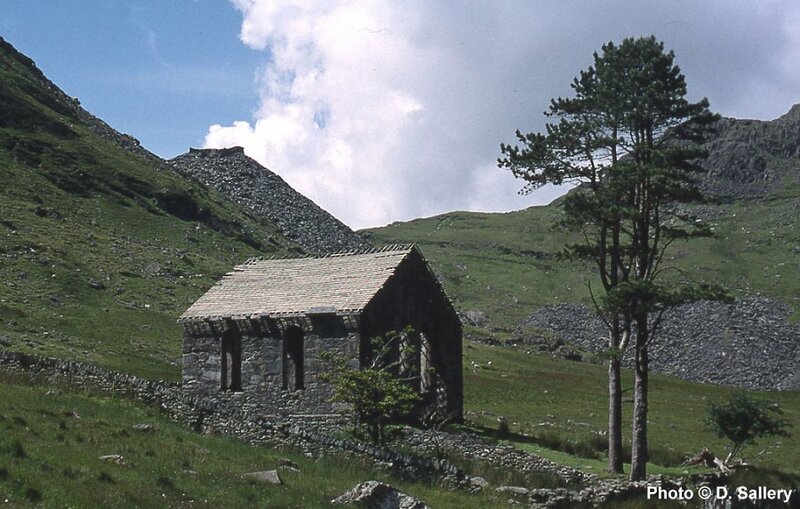 It was also used as a schoolhouse to educate the children of the quarrymen and farmers of Cwmorthin. Since this photo was taken in 2000, the chapel has lost what remained of its roof. Some more recent views can be seen here. gardens of the house. Without such protection the local sheep would soon make short work of the saplings. 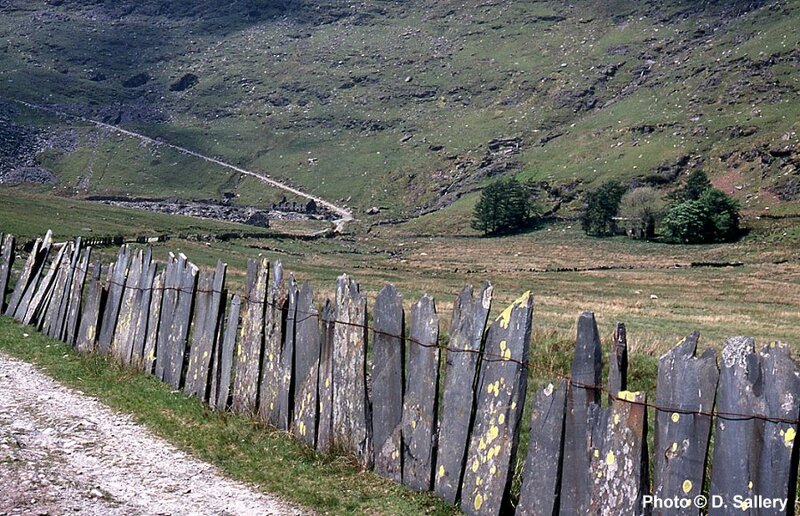 The slate fence, in the foreground, was a cheap and easy way to mark boundaries using quarry off cuts. As long as the wire at the top is regularly replaced such structures have an indefinite life.